The Kevin Hart comedy "Ride Along" continued to speed through a typically quiet box-office frame, while the monster thriller "I, Frankenstein" couldn't be roused from the dead. 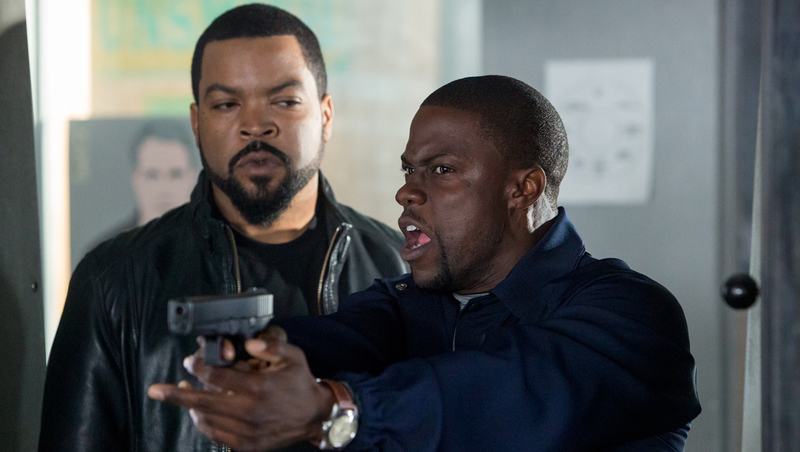 Universal's buddy cop comedy "Ride Along," co-starring Ice Cube, cruised to the top of the box office again, taking in $21.2 million in its second weekend, according to studio estimates Sunday. The film last week set a January debut record, with $48.6 million over the three-day holiday weekend. Aaron Eckhart, Yvonne Strahovski on "I, Frankenstein"
But "I, Frankenstein" had a sizable budget, estimated at $65 million, yet opened with just $8.3 million. Starring a beefed-up Aaron Eckhart as Mary Shelley's famous monster in a modern-day setting, the 3-D film wasn't screened for critics and came into the weekend with little buzz. Lakeshore Entertainment financed the film, which was distributed by Lionsgate. Two family films trailed "Ride Along" and "Lone Survivor." The animated squirrel comedy "The Nut Job" made $12.3 million in its second week for Open Road Films. Disney's juggernaut "Frozen" added $9 million for a 10-week domestic total of $347.8 million. Hollywood will largely cede next weekend to the Super Bowl, except for new releases "Labor Day," starring Kate Winslet and Josh Brolin, and "That Awkward Moment, with Zac Efron and Michael B. Jordan.